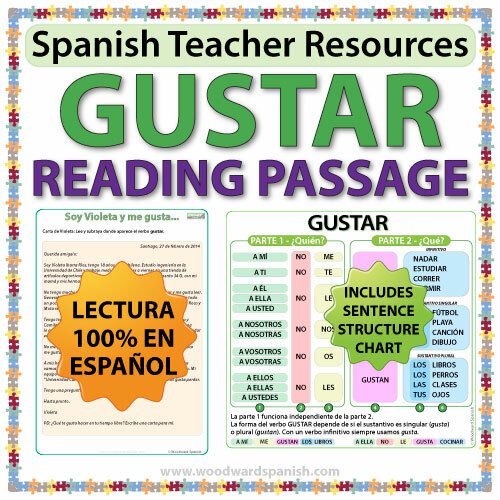 A Reading Passage in Spanish about the verb Gustar (= LIKE in Spanish). There are comprehension questions referring to the text and additional activities to practice making sentences with GUSTAR. We have included a full-color chart showing the word order (and correct grammar) of sentences with the verb Gustar. There is also a smaller version of this chart (2 per page) which you can easily photocopy and give to students as reference handouts. 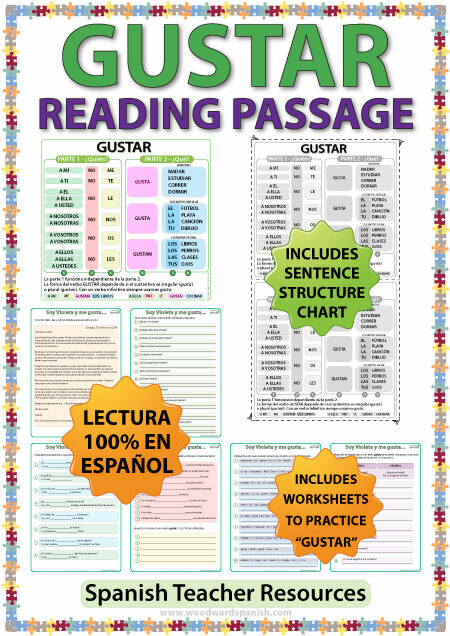 The teacher lesson plan, the reading text, questions and instructions are 100% in Spanish making it ideal for language immersion classrooms. Una lectura basada en el verbo Gustar. Lo que Violeta y sus hermanos les gusta y no les gusta.